My Dad's mother was from Cornwall, and came here when she was - if I'm remembering this correctly - sixteen, to live with her married sister. Anyway, fast forward to after she was married and a mother, she would make these for my dad and his younger sister. (my mother writes) - "This recipe was sent May 3, 1970 to us from...Grandmother Wilke, after they moved out west. Their first intention was to locate in California but then opted for Arizona, where they stayed for a number of years. 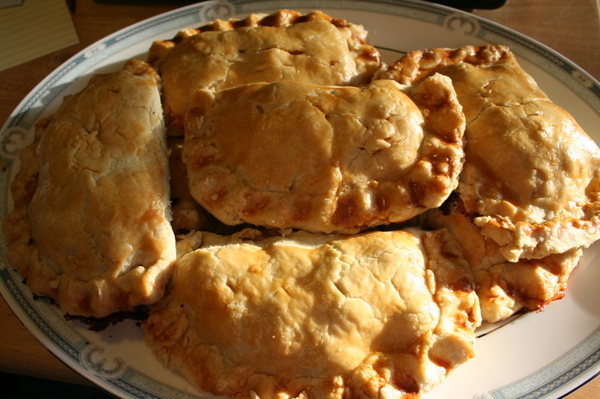 This pasty was not the more readily made beef and potato one, but a variation from Cornwall." In her (my grandmother's) words: "Thought I'd start off and tell you about the leek pasty - You make that in one big one, so roll out pastry as big as you want. (Usually a 9-10 inch pie plate). Slice up a bunch of leeks into 1/4 inch slices (3-4 leeks). 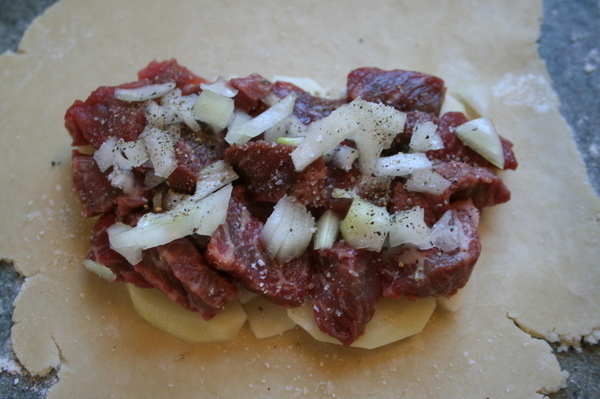 Lay pastry into pie plate and add sliced leeks. Beat together 2 eggs, some chopped ham or bacon then pour over leeks. 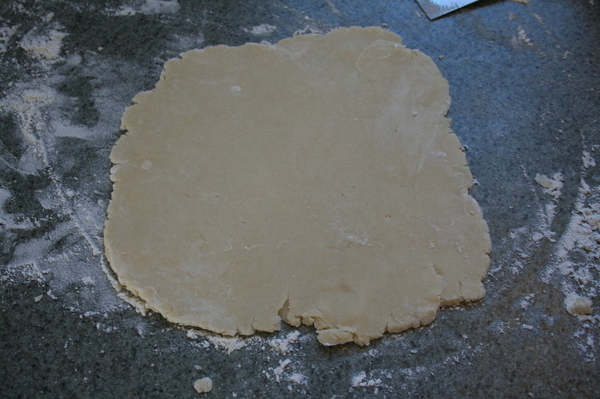 Cover with top layer of pastry. Bake at 325 degrees for 30-40 minutes until nicely browned. May be served hot or at room temperature." Oddly enough, I don't remember having the leek version as a child - I remember the meat ones. I remember my mother rolling out the dough, standing at her floating work island in the kitchen (actually it was the dishwasher - it had a thick cutting board on top and she used it for most of her baking projects- and it was on wheels, so when she needed it she could roll it into place closer to the sink and stove and fridge). I also remember her chipping the potatoes - cutting them into little pieces as she made each pasty. She made one for each of us, and cut slits in the top crust to form our initials. This was also so that no one would get hers - she liked a bit of turnip in there besides the meat and potatoes. 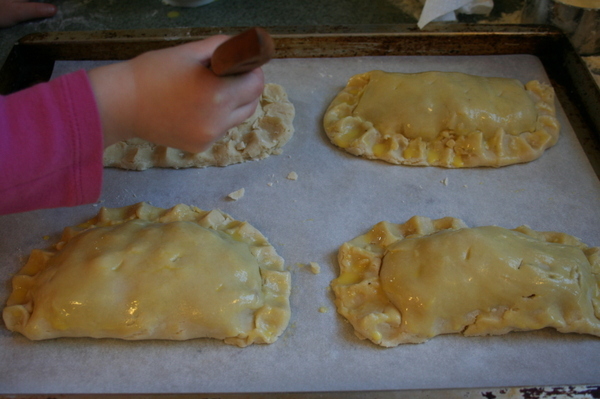 Pasties were often specifically dinner for Dad's birthday. And the way I remember eating them was this - you'd slice open the top of the pasty, right around the curved part, just above the crimped edge. Then you'd put some butter on each side, and pour a little milk on it. Yeah, I can see some of you cringing. Huh? Pour milk on it? No, it's not traditional. But according to my father, when he was a boy, his mom did that to cool it down for him. So that's how HE ate them, and that's kind of how we learned to. But it's not required. To my horror, my husband puts ketchup on his. I can't watch that. Although I'm sure people put all sorts of things on them - HP sauce comes to mind. The first time I made them on my own was for my father's birthday. My mother wasn't available to do it that year, so I decided to do it myself. And for some reason I was a nervous wreck about it. But I was often a nervous wreck back then, so I guess it's not all that surprising. But pasties are pretty forgiving things - and mine came out fine. I made them last night for part of our dinner, and I must say they were the best ones I've ever made. I don't know how that happened, but I'm not complaining. Make the pastry dough. Now, you can use any pastry dough recipe you want to use - whatever you're comfortable with. Combine the flour and salt and either put them in a food processor (my new favorite way) or in a large bowl. and either pulse about 5 times in the processor or cut the shortening in with a pastry cutter or two knives or your hands. 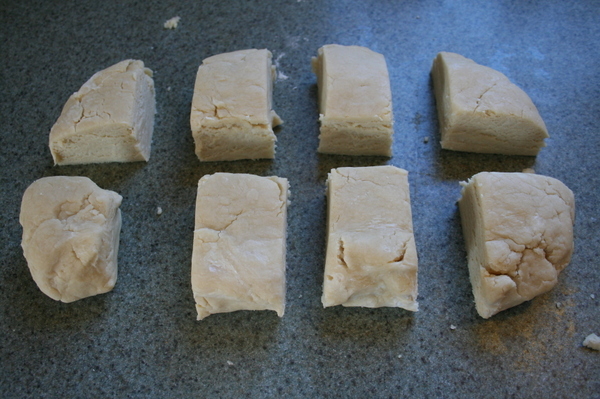 You want the dough to have some lumps of shortening around the size of peas, and the rest to look look like coarse sand. Next - add the water a little at a time. 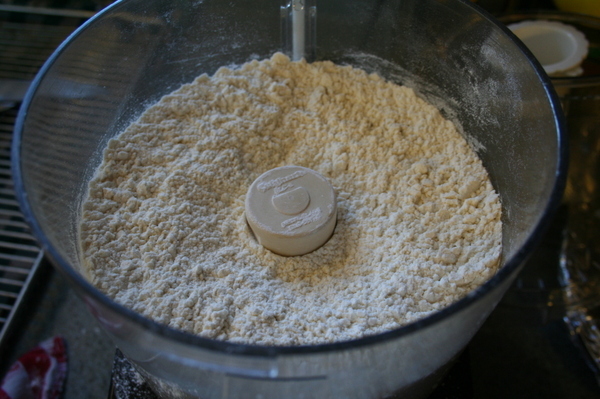 If using the food processor, pour in a few tablespoons, then pulse. Add another tablespoon or two, then pulse. 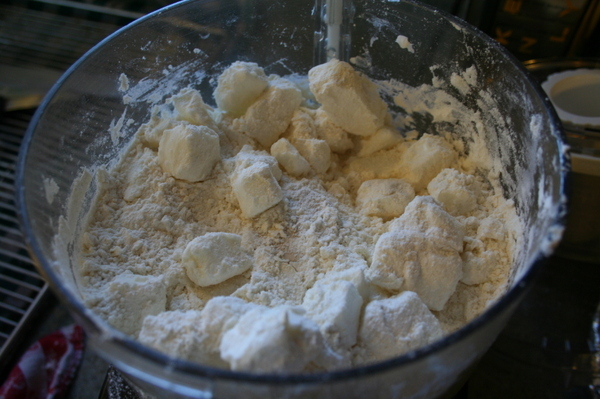 If you're working in a bowl, then drizzle in some water, and toss the flour/shortening mixture with a fork. Then more water, then toss again. 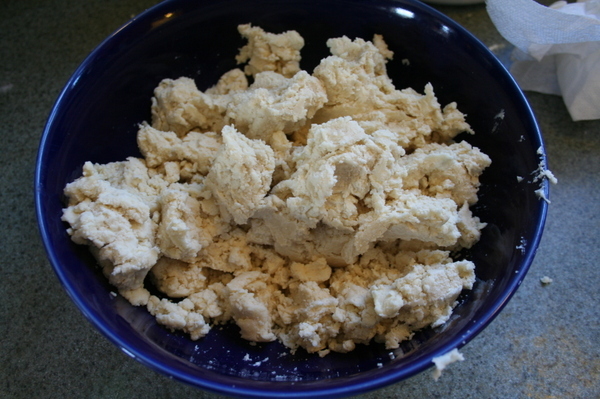 The idea is to GENTLY incorporate JUST ENOUGH water to bind the flour/shortening mixture. You don't want it soggy, you don't want it too dry, and you definitely don't want to overwork the dough because it will activate the glutens in the flour and the final product - the pie shell or pasty shell - will be tough. 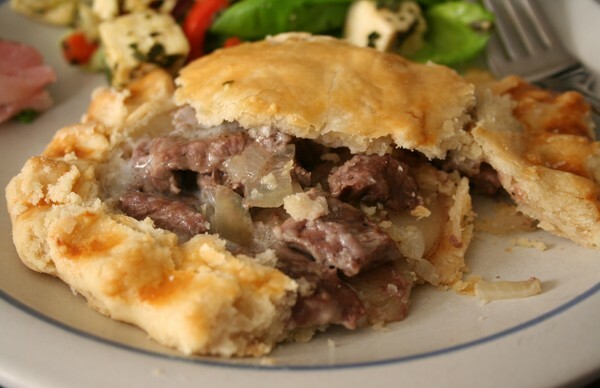 For pies and so forth, and pasties, you want flaky and tender. Once the dough JUST comes together, pat it into a ball, press down into a disk, wrap in plastic and refrigerate for at least half an hour. While the dough is chilling, you can prepare the filling ingredients. 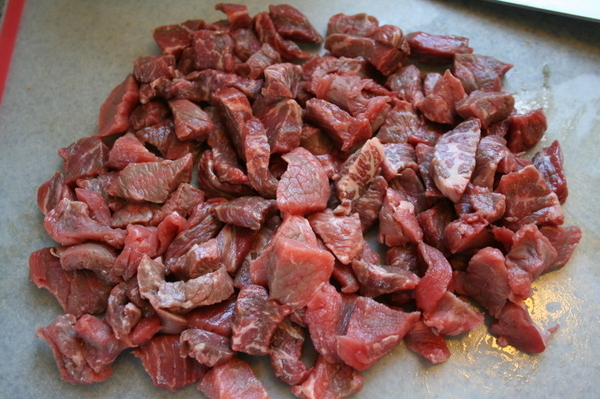 About a pound of stew beef, either cut in chunks or not. 4-5 medium red potatoes, or any other kind of potato you want. 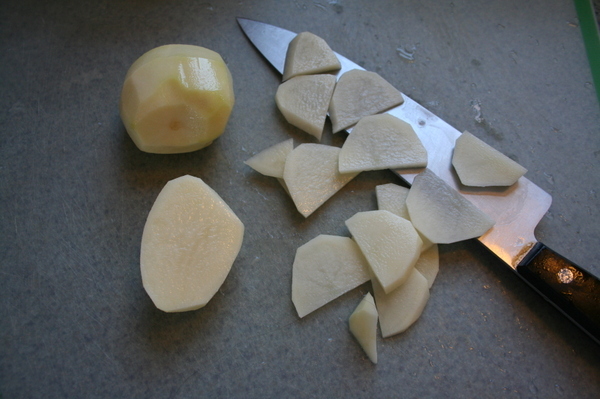 You want about the same amount of potatoes as meat, once it's all cut up. 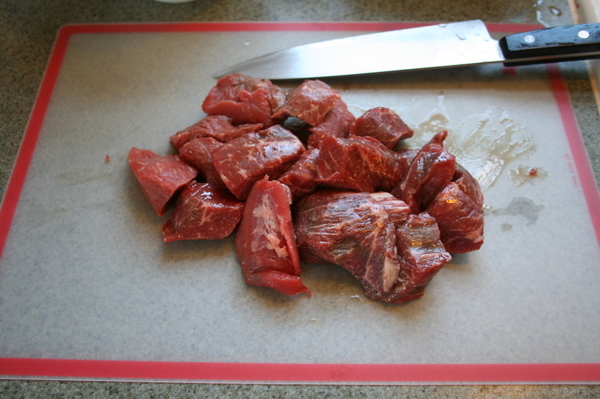 Cut the beef into small pieces - about 1/4 inch thick and about 1/2 inch to an inch wide. 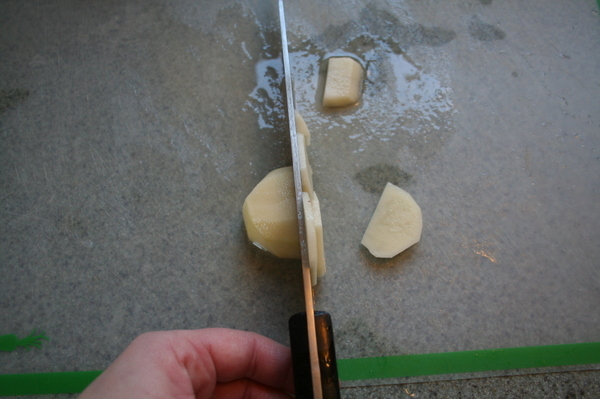 Cut the potatoes into pieces about the same size as the beef, except you want them about 1/8 of an inch thick. Get out a couple of baking sheets and line them with parchment or foil. Roll out four of them into rough circles about 1/8" thick. 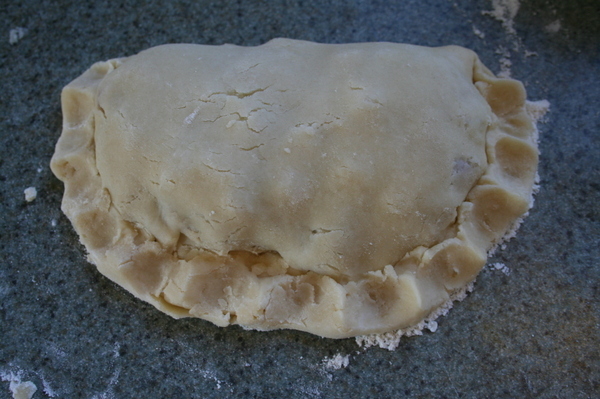 Place some potatoes on one half of each dough circle, leaving about 3/4 inch of an edge for sealing the pasty. Next, place some meat on top of that, and then a healthy sprinkling of onions. Do all 4 this way, then sprinkle generously with salt and pepper. 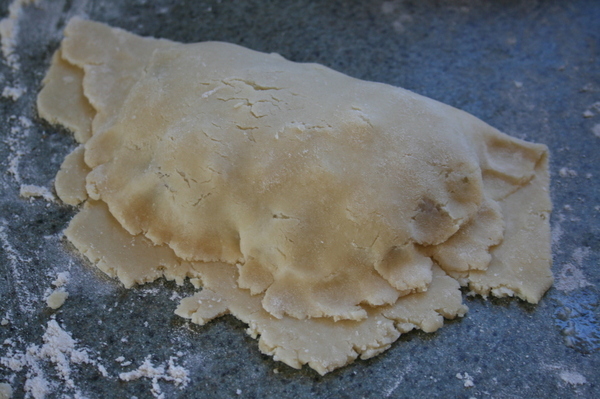 Now, carefully, fold the other half of the dough over the filling and press down along the edges to seal. Curl the dough over on itself to keep it sealed, or press with the tines of a fork, or crimp it - whatever you want to do to make it pretty. Place on one of the baking sheets. Cut a few holes in the top with the tip of a knife to allow the steam to escape, and the brush with the egg wash. Do the same with the other three you just made. And now repeat the entire procedure with the other 4 pieces of dough and the rest of the filling ingredients and place on a second baking sheet. Place sheets in the oven and set your timer for 15 minutes. When the timer goes off, rotate the pans so all the pasties bake evenly. Set for another 15 minutes, and then check again every five minutes or so if they still aren't done. Pasties should be golden brown and steaming hot. Serve with a salad if you want to. Do the butter and milk thing - or not. They're fine without that. I added just a bit of butter because hey, it tastes good, it adds a bit more moisture to the crust, and because I'm a creature of habit. But mostly because it tastes good.